NS 117 with the old and new signals at "Cumberland Chair"
New York Central 1066 in the fog at West Waddy, just after sunup on a wet Friday morning. 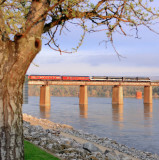 A NS Brandt truck with 3 empty air dump cars passes 61A as it waits for a Louisville cew at the wye. NS 111 passes the intermediate signals near MP 300W at Veechdale, as they near the top of the hill at Joyes. NS 111 heads South out of Danville after a quick stop for fuel. NS 111 gets back on the move at Bowen, after stopping to let 23G run around. Old Logo on a new motor. Southbound 295 passes train 77J at the Wye. 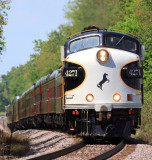 NS 76J rolls through Vanarsdale on a warm August evening. Chevy vs EMD and 12,000 tons of coal , 1067 almost got some red paint on it. NS 50A is making a run for the steep grade up Kings Mountain as they cross the Green River Bridge at Southfork. NS (NKP) 8100....aka, The Sarge! NS 8114, No horsehead here.. 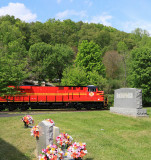 The sound of 4 hard working EMD's fill the cut at Kings Mountain on a perfect Spring morning. 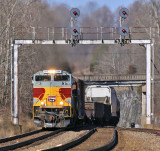 NS 951 is about to pass under the US 27 bridge, as they start down the long and twisting grade to Oakdale. 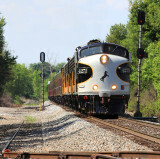 The Southbound OCS passes the CSXT connection at CP Strange. OCS 952 leaps across the New River Valley in a classic CNO&TP view. 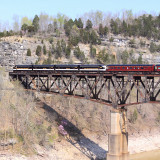 Northbound 952 departs Burnside and crosses the Cumberland River Bridge. They will arrive in Danville in less than a hour. Outstanding photos! I hope things are well in the Bluegrass Area.